The map is not the territory, runs the famous quote, but maps do represent an unparalleled tool for emergency management. Nobody knows this better than humanitarian organisations like MÃ©decins Sans FrontiÃ¨res, whose work often occurs within territories without any usable maps whatsoever. ESA has been working in partnership with MÃ©decins Sans FrontiÃ¨res (MSF) Belgium to remedy this. The result is the Medical Humanitarian Disaster Mapping Service (HUMAN). Since last year the service has been using satellite imagery to prepare on-demand maps of remote areas for humanitarian organisations. 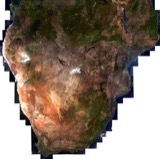 Now HUMAN has gone one better, enabling those organisations to make their own customised maps across most of Africa. Arnold is an emergency officer at the MSF headquarters in Brussels. He recently received a call from the Congolese field team reporting new cholera cases near the city of Luebo. The immediate question is; Where is Luebo? There will soon be demands from the office, as he will have to inform his counterparts of the developing situation. But there is no detailed map of the Congo in the office library and it is too costly â€“ and too long â€“ to order a special reproduction of a new map when the team has no idea of the seriousness of the crisis. The need is for something quick and simple. These issues are often faced by relief organisations and the pressure is to be fast and accurate. Off-line mapping services are expensive and do not have the response time required for simple fast delivery products. HUMAN wanted to provide these organisations with a tool that could satisfy their needs. The tool should give aid workers fast, reliable access to geographical information. HUMAN has created a web portal that answers these needs by giving access to a complete mapping creation tool. The portal is available 24 hours a day and is accessible with a usual web browser. What does the HUMAN web portal offer? 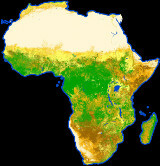 A geographical database of Africa between the tropics, with exceptional detail, is now accessible on-line. As well as the classical functions of mapping navigation such as zooming in for detail or panning across a territory, the user is able to identify specific features such as roads, rivers, cities and airports â€“ or topography â€“ all displayed on the screen by accessing a database. It is possible to perform searches on the database for specific localities or facilities. The search results also provides a zoomed map of the region of interest. The most important advantages are the ability to fully customise maps by inserting logos, lines, annotations and points. The locations can be accurately located with geo-positioning information. Once the customised map is ready, it can be integrated in a map template, displaying the organisation logo, name and additional information then downloaded in JPEG or PDF format, on sizes ranging from A4 to A0. HUMAN also produces maps off-line for relief organisations. The maps previously created for the humanitarian organisations are all available on the website as downloads. Humanitarian organisations are showing increased interest mainly because the on-line web mapping system answers their information needs. It allows them to rapidly create a customised map on any place in Africa between the two tropics. The portal has been offered to other humanitarian organisations for a test period. In the future, this service could be shared between humanitarian NGOs and associated groups. The cost of the infrastructure will then be shared. As well as some technical enhancements, it is foreseen to extend the coverage by integrating data on Asia, the Middle East and South America. The creation of user profiles is an improvement that will allow users to retrieve a previous customised mapping project that they have designed and then built on the earlier version, if required. Development of the HUMAN portal was funded by ESA under the Data User Programme. As end users, MSF Belgium has qualified and tested the system in case areas across Africa where its staff are active on the ground. Belgian company Keyobs is responsible for implementing the project. The long-term intention is to build HUMAN into a self-sufficient service for non-governmental and public organisations. INTECS Hard Real Time S.p.A.